Which Content & Technology Is Driving Today’s Demand Generation? Find out how your content strategy, program mix, and marketing technologies stack up against those of your peers, and learn the steps you can take to improve campaign performance and increase demand generation ROI. 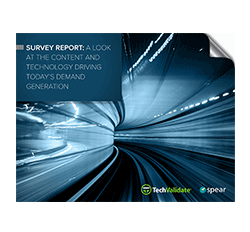 Request our new 20-page survey report, “A Look at the Content and Technology Driving Today’s Demand Generation”, to learn the tactics, content types, and marketing technologies that more than 200 top B2B marketers consider most essential to demand generation success. Fill out the form at right to request your free copy and discover how to start making demand gen work harder for your business. Marketing is growing more technical all the time, with required skillsets changing more rapidly than marketing departments can hire and adjust. As a consequence, there appears to be a real talent gap in the field.